The memorial has suffered considerable weathering. CAPTAIN WILFRED BURRELL THOMSOM (sic), M.C. The information on this memorial differs from official records in at least two respects. Firstly, the subjects name is misspelt and secondly the date of death on the Commonwealth War Graves Commission Debt of Honour Register is 25th March 1917 (see below). Captain Thomson's father was Colonel Surgeon Wilfred Burrell Thomson of the RAMC (Royal Army Medical Corp). Records show that Colonel Thomson and his wife Charlotte were resident on Portsea Island (now Portsmouth) at the time they were married in 1887. This is the only direct evidence held on a connection between Captain Thomson and Portsmouth. His parents apparently moved to Plymouth at some point and either had moved back to Portsmouth by the end of WW1 or retained sufficient attachment to the city for them to have erected the plaque to their son in the Garrison Church. Captain Wilfred Burrell THOMSON is remembered on the Basra Memorial, Iraq. His MC was gazetted on 18/8/1916 in issue 29712. At the time of the 1901 Census was at school in Plymouth. The 2nd Dorsets were part of the 9th Brigade, 3rd Indian Division at the time of his death. BIRTH DATE: 24th Oct 1894 - at St. Ann's Garrison in Barbados. Captain Thomson was appointed Second Lieutenant on 24th January 1914. He was mentioned in a Despatch dated 17/01/1916 for gallant and distinguished service in the field (actual mention 13/07/1916?) and was awarded the MC 18/08/1916. The outbreak of the Great War of 1914-1919 found the 2nd Battalion of the Dorsetshire Regiment about half-way through a tour of foreign service, being quartered at Poona, where it formed part of the 16th (Poona) Brigade of the 6th Indian (Poona) Division. On 12th October 1914 the 2nd Dorsets left Poona for Bombay, where they were to embark. The embarkation strength was 22 officers (including 2nd Lieutenant W B Thomson), 5 warrant officers and 869 other ranks. The Battalion, which had embarked on the H.T. "Varella", a British-India liner, on October 12th, did not quit Bombay until 18th October and arrived at Bahrain on 23rd October 1914. On 2nd November 1914 War broke out with Turkey (who had aligned themselves with Germany) and the 2nd Dorsets quit Bahrain the next day for Kharag Island, with a view to landing at the mouth of the Shatt Al Arab. In February 1915 Lieutenant Thomson was given orders for the training of thirty-two men, in the management of local craft called "bellums". These were vessels of shallow draft and consequently very useful in navigating the many creeks and branches of the rivers and the flooded areas which were now spreading out in all directions as the annual floods came down the Tigris and Euphrates. Their first practices up and down the Ashar Creek caused much amusement to the local professionals, but before long the squad had become quite proficient. 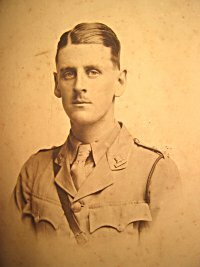 In April 1915 (in Iraq to the East of Barjisiya Wood) Lieutenant Thomson was wounded in a fierce attack upon the Turks in which the Dorsets had borne a prominent part in the days's fighting. The Battalion had lost nearly a quarter of its strength and no less than fifteen officers. In May 1915 Lieutenant Thomson rejoined the Battalion on recovery from his wounds and in an action in September 1915 was described as showing splendid leadership in the charge against the Turks. However Lieutenant Thomson was again wounded. Lieutenants Baillie, Dean, Simmons and Thomson and about 100 of the less seriously wounded were left behind at Kut, and found the hospital arrangements - if they could be dignified by that name - anything but adequate, a foretaste of worse things to come. In early November 1915 Lieutenant Thomson again rejoined the Battalion on recovery from his wounds. At that time there was not a little sickness, mainly fever, but including some cases of beriberi. There was a terrible fight with the Turks on 23rd November 1915, at Ctesiphon, which resulted in crippling losses amounting in all to 4,500 men. The 2nd Dorsets had two officers killed and 8 officers wounded, including Lieutenant Thomson, and 25 men killed and missing and 207 men wounded (243 in all). Lieutenant Thomson (who had been seriously injured) was sent to Basra to recover. In January 1916 Lieutenant Thomson was appointed as Adjutant and Quartermaster of a combined Depot (which included the Black Watch and the Seaforths). On 19th May 1916 Lieutenant Thomson, who had just rejoined from the Depot, was in charge of a reconnoitring patrol which pushed forward and entered enemy lines, only to find them empty. In July 1916 Lieutenant Thomson was one of the commanders of the four companies of the 2nd (Provisional) Battalion Dorsetshire Regiment. News was received in August 1916 that Captain Thomson (who had just been promoted to that rank in July 1916) had been awarded the M.C. In September and October 1916 there were some invalidings - including Captain Thomson (from illness). During February 1917 Captain Thomson rejoined - from India. In March 1917 there was an attack by the Turks near Shahraban during which the brigade was being opposed by superior forces on difficult ground. The Ghurkhas were thrust back (because two reserve companies of the Mahrattas were not able to arrive in time) and this allowed the Turks to work round behind "G" Company's left and cut off two of its platoons. These, under Captain Thomson, put up a most determined resistance, fighting stubbornly and selling their lives dearly. Captain Thomson, conspicuous for his white breeches, could be seen rallying his men and encouraging them to maintain the fight, but to extricate this party was impossible for want of reserves and artillery support. The missing, following the subsequent withdrawal, resulted in 800 casualties out of a total strength of 2,000. The Dorsets with over 200 casualties out of some 500 in action, being the second hardest hit (the 105th Mahrattas lost nearly 300). The missing came to over 100 and included Captain Thomson. The book states "Captain Thomson was another who was much missed. One of the few still with the 2nd Battalion who had come to Mesopotamia in 1914, he had been wounded twice and invalided once, but had returned again and again and had shown himself a gallant and resourceful leader." Information was afterwards received that Captain Thomson had been wounded and taken prisoner. He was traced as far as Kirkuk but beyond that nothing was ever heard of him: it can only be imagined that he was killed, possibly in attempting to escape, or died of disease. Captain Thomson probably died in captivity on 22nd April 1917. He was 22 years old. There is another memorial plaque on which is inscribed the name of William Burrell Thomson. It is at Hardingstone - a small village 5 miles from Northampton on the Newport Pagnell Road. His father was Medical Officer at the Northampton Barracks from 1912 to 1919.